It's Holiday eCard Planning Time! It's been an unseasonably warm Fall in the Northeast of the United States but, as usual, I have holiday decorations and snowflakes on my mind. I can't think of a better way to get into the holiday spirit even though I still have tomatoes ripening in my garden - go figure! It's hard to believe but the winter holiday eCard season is fast approaching and we have lots of new eCard and invitation designs on the drawing board. Literally! So while we're finalizing some absolutely beautiful Thanksgiving, Season's Greetings and Happy New Year eCard designs, you should also be in the planning phase. Here's a quick primer on what you can do now to start preparing for sending your holiday eCards this year. Create and schedule your holiday eCards now. Right now is a great time to create your eCards and message. We always recommend that you send an eCard to yourself, to make sure you like how it looks, and then make an "eCard template" so you can easily use it during the holidays. 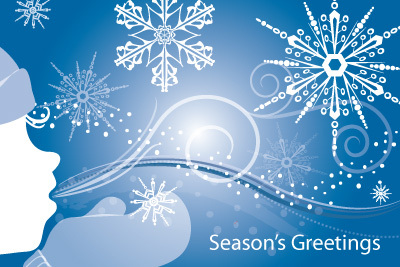 You can also address and schedule your holiday eCards now to be sent on any day in the future. At any time, up until the date your eCard is scheduled to be sent, you can add/remove people from the address list. If you later find an eCard design you like better or you want to change the text of the eCard, no problem! Just access the scheduled eCard and make your changes. It's that simple! Display Your Holiday eCards on Your Website and in Social Media. You can include a link from your website to your holiday eCard by using our 'Direct Link' feature. You can also share your eCards in social media like Facebook, LinkedIn, Twitter and more. Check out our tutorial for posting eCards in social media. Clean and Refine Your Email Lists. Start gathering and refining your holiday eCard list now rather than waiting to the last minute. You can easily import your email addresses into your CorpNote address book and then create "groups" of contacts so you can quickly send holiday eCards to those groups of people. For example, you might create groups for current clients, potential clients, vendors, colleagues etc. This enables you to send a different, targeted message and eCard design to each group of people. Consider a Custom Holiday eCard. Be different! Have CorpNote design a custom animated eCard that tells your story. The year in "pictures" can sometimes mean much more than words. If you need help, contact our art department at 609-406-1665. We love being creative! The above will get you started but I am sure you can think of lots of innovative ideas too!